The John and Elsie McMillan House in Sturgis has recently been added to the National Register of Historic Places, according to the South Dakota State Historical Society. Built in 1887, the John and Elsie McMillan House is listed on the National Register for its local significance in architecture. 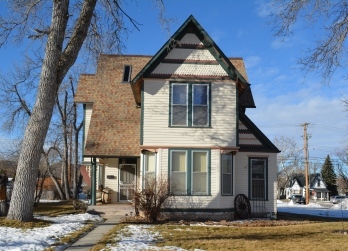 It is a good example of the Queen Anne Style and one of the few Victorian-influenced homes in Sturgis that retains high integrity. Both the exterior and the interior of the home have been minimally altered from the original construction. In 1878, at age 32, John C. McMillan and his wife Elsie moved from Wisconsin to Sturgis. Upon arrival they took up a homestead claim near town, and he went to work for a trader at the nearby Fort Meade. Two years later, he successfully engaged in the shoe and boot business in Sturgis, which eventually led to the McMillan Mercantile business in 1881. He and Elsie had five children. John was also active in politics, serving as city councilman, mayor, and chairman of the state and county Republican central committees. "South Dakota's history is rich in American Indian culture, pioneer life and change," said Jay D. Vogt, state historic preservation officer and director of the State Historical Society, headquartered at the Cultural Heritage Center in Pierre. "Properties listed on the National Register are important for their role in South Dakota's culture, heritage and history. And when properties get listed, it shows that their owners take pride in their role in preserving that culture, heritage and history." For more information on the National Register or other historic preservation programs, contact the State Historic Preservation Office at the Cultural Heritage Center, 900 Governors Drive, Pierre, SD 57501-2217; telephone (605) 773-3458 or website history.sd.gov/Preservation and click on National Register of Historic Places in the right column.